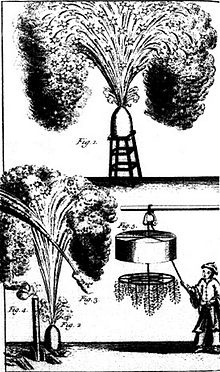 The history of marvelous Chinese inventions is fascinating. 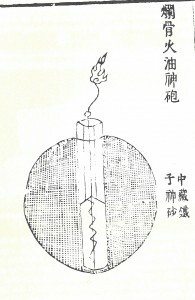 The invention of firecrackers is an example. 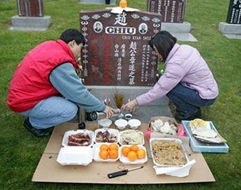 The word for firecracker in Chinese is bàozhú (exploding bamboo) and is derived from the original firecrackers used in ancient China, perhaps as far back as the Han Dynasty (206-220 BC). 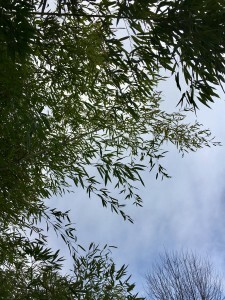 At that time, pieces of green bamboo were thrown into a fire and then the bamboo would burst apart with loud bangs. In other words, these original firecrackers were not the same as those developed later, no gunpowder was included. 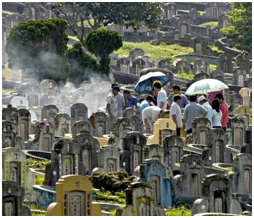 Li Tian, a monk living near Liu Yang city, Hunan province, is credited with having invented the modern firecracker. According to mythology, Li Tian filled a piece of bamboo with gunpowder to frighten away a persistent ghost that had been bothering the Tang Dynasty (618-907 AD) emperor Li Shi-ming. The loud bang did the job. The ghost fled and the emperor once again had peace. 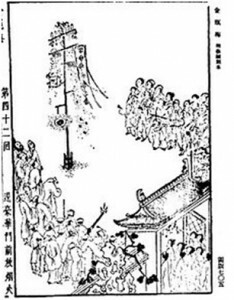 In honor of this great invention (pyrotechnic fireworks), Chinese traditionally held a festival in Li Tian’s honor on April 18th. 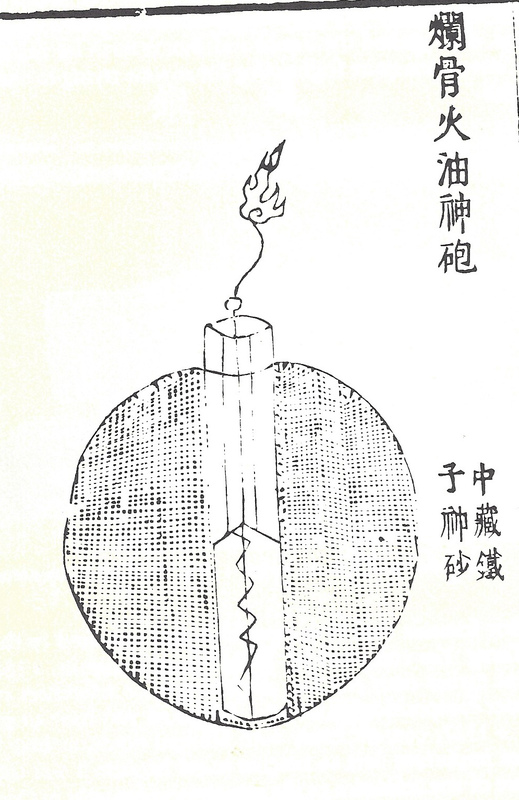 By the end of the Northern Song Dynasty (960–1127 AD), firecrackers consisted of paper tubes stuffed with gunpowder. The tubes were tied together with rope, forming a long string of firecrackers, which could be set off in succession. This produced quite a display of noise and smoke. 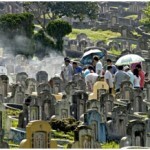 Noise and smoke, both are considered important for protecting a household. Noise chases away ghosts and other evils, such as poisonous insects (see my January 5, 2014 blog on the 5 noxious animals also sometimes called the five evils) and sickness. Smoke cleanses the house and also gets rid of poisonous insects and dampness, which can cause illness. Therefore, for a couple of thousand years firecrackers have been synonymous with health and peace, which leads to a prosperous future for the family. Illustration: “Ming Dynasty Jin Ping Mei fireworks” by Unknown – Jin Ping Mei, from Science and Civilisation in China p. 140. Licensed under Public Domain via Wikimedia Commons – http://commons.wikimedia.org/wiki/File:Ming_Dynasty_Jin_Ping_Mei_fireworks.jpg#mediaviewer/File:Ming_Dynasty_Jin_Ping_Mei_fireworks.jpg. 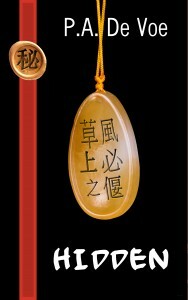 Shén 神 Another choice for mysterious or mystery? Last week I talked about the character 秘 mì mysterious / mystery that I am going to use in my Ming Dynasty trilogy covers. There are other characters with the definition of mystery or mysterious. Another one is 神 shén. However, when the character shén is used it implies mystery in the sense of spiritual. One way for a non-native Chinese speaker to discover which character is best is to look up what other words use that particular character. This gives a good idea of the underlying connotation versus the character’s denotation. For shén [using the on-line dictionary http://www.mdbg.net/chindict/] we do find the word mysterious/mystery with both 神秘 shén mì and it is defined as “mysterious / mystery.” However, there are many other words which use shén and refer to the divine, to Daoism, mythology, mystical, gods, and the miraculous. What does this imply? Well, if you are writing a mystery which centers on the supernatural and paranormal, perhaps you would want to use the character 神 shén versus 秘 mì because it implies a particular kind of mystery or mysterious event. It subtly alters your readers to another layer of meaning and insight. Another character which can mean mystery is 玄 xuán. When xuán is used as a part of a word, we find a predominance of words referring to philosophical and spiritual schools of thought—Daoism, Buddhism, Confucianism. Xuán is also used in word combinations that refer to something being abstruse, simply difficult to understand. So, again, we find that although 玄 xuán can be used to mean mystery, it has a different underlying connotation from both神 shén and 秘 mì. When choosing a Chinese word we have so many choices because each character used in creating that particular word brings with it a strong intellectual and emotional component. So, while my Mei-hua trilogy has religious and folk traditions included, they are a part of the cultural background of the period, not the central component of the stories, therefore, the character I chose was 秘 mì. I am working on getting out my first Mei-hua story. 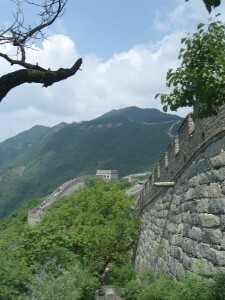 The novel is part of a YA historical/adventure trilogy set in 1380 China. Mei-hua, the biracial daughter of a magistrate, finds her world turned upside down when her father is targeted by a political enemy. I have had a lot of fun researching and writing this trilogy. This year I will begin publishing the Mei-hua series as an indie author and one part of the indie project is creating covers. To tie the three books together, I wanted the covers to have a similar feel. Kelly Cochran, who is designing them, came up with a splendid idea: use a ribbon with a seal on it and place the ribbon on each front cover. 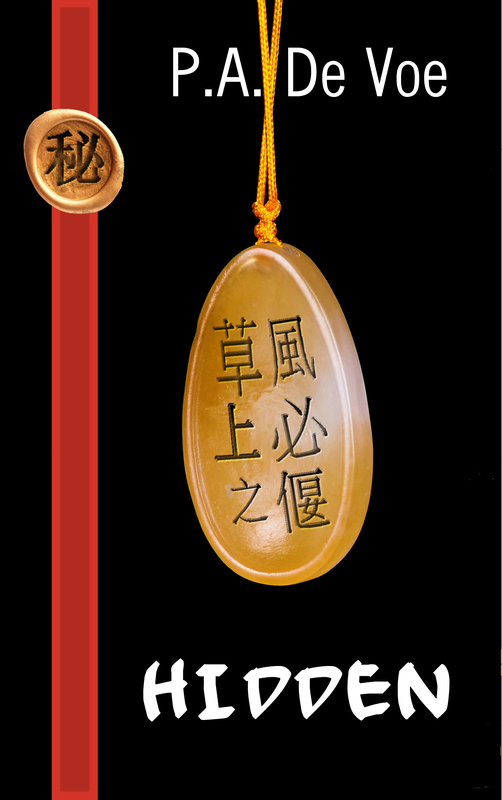 Since the trilogy is also a mystery, the character for secret or mysterious [mì, mih 秘] is stamped on the seal. In checking out this character (remember that the actual character used for Chinese words infuse the word itself with another layer of meaning), I noticed that mì, mih is a part of the word for secretary 秘書 mì shū, mih shu. The second character for secretary [shū, shu] means book. This combination [mì+ shū] struck me as a wonderful description of the role of secretaries—keeping in mind that this word was apparently used historically for an official secretary, such as one who works in the government, which is often a powerful position. What does this combination of characters mean when referring to the secretary’s role? I think it means that the secretary must be discrete and not spread information about what he does and learns in his job, because a secretary is privy to extremely sensitive information. Of course, 秘書 mì shū, mih shu could also refer to written materials, such as ledgers and documents that the secretary writes and keeps track of. . 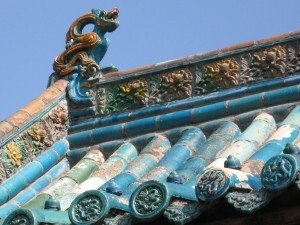 In either case, the Chinese character’s original meaning imparts a special meaning to the new word, secretary, with a connotation beyond the noun’s simple denotation. It suggests secrecy, confidentiality, and concealment. How much fun is that!